We don't look for adventure… Adventure finds us! (Dancalan, Donsol, 8:20 a.m.) From Irosin, it took us 2 hours to reach Donsol because the backroads of Pilar were really narrow and twisty, requiring a modest 30-40 kph speed in the tight curves and switchbacks. In some parts, its basically a paved-over old horse trail, so narrow that it is almost one lane and a half width only at its widest. (Just like in some parts in the French alps where there are no more median lanes but only shoulder lane width markers.) If a car approached you, you’d have to slow down first then squeeze on the remaining space to get by. If you were on a car, both you and the approaching car have to run on the shoulder a bit to pass through. It was only during the mid 2000’s during the “Arroyonomics” of boosting tourism as a driver of economy (WOW Philippines) when Donsol developed due to its whale shark watching potential. The roads in most sections though have yet to be widened to secondary roads standard, even though it’s marked on the maps as a primary road. We stop at the first busy major town where some had to fill up with fuel, and for me to get a warm cup of taho (or soybean milk pudding with caramel syrup and tapioca pearls) from the vendor that passed by just where the signs point to the Butanding or Whale Shark. T’was Good to have something for the belly since leaving Irosin (didn’t grab a bite there). Donsol is Butanding Central, where these gentle giants naturally congregate due to the abundance of plankton due to the nutrient rich currents that pass through these channels. Other sites have since bloomed as well such as in Oslob, Cebu but only in Donsol can you find them in their natural habitat, and not allegedly lured by the fishermen there and thus affecting their migratory pattern. After filling up, and waiting for Rosdom’s welcoming party to meet us here, we proceeded to the seashore where the Butanding Tourism Center and the resorts were for a pictorial. We really had no time in our itinerary to swim with these gentle giants. It was great to see the tourists being taught how to interact properly with the Butanding to keep them from being harmed by too much human interaction (like the bears in the US national parks, which have to be killed if they show too much errant behavior like stalking or actually harming humans). It would’ve been nice if we had the chance to overnight in these resorts instead of roughing it in that Irosin spring resort, but after riding through those narrow twisties, I would imagine half the group cursing me as the navigate through it in complete darkness. It would’ve been an adventure though… but I’m not regretting it. 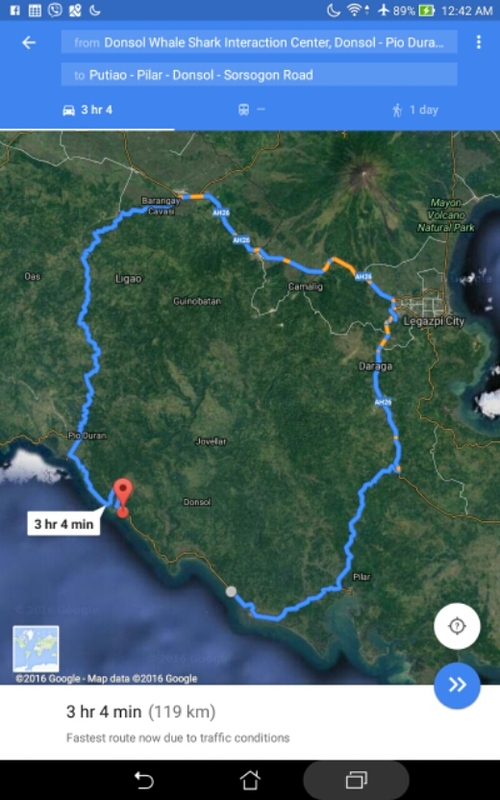 In fact, because google maps is suggesting a longer way round instead of going ahead on this road to get to 12kms where we want to go, I believe the real adventure (or rather misadventure) is just about to begin! Day 2 SBB Lunch: Khao Soi! suzukibigbikerph on Oh those lovely curves! klwaarala on Oh those lovely curves!